The Western New York Flash has announced it’s 19-player roster that will begin the 2015 National Women’s Soccer League regular season on Sunday when the Flash visit Seattle Reign FC. The Flash saw much player movement throughout the 2014-15 offseason, bringing an infusion of young, versatile talent to Western New York. After selecting six players in the 2015 NWSL College Draft, including four in the first round, the Flash roster currently has an average age of 24 years old. Most recently, the club acquired U.S. Women’s National Team forward Sydney Leroux and Amanda Frisbie in a trade with the Reign. Leroux becomes the Flash’s second U.S. allocation, joining Whitney Engen who was acquired by the club via trade in October. Defenders Brittany Taylor, who enters her third season with the club, and Kristen Edmonds along with forward Jasmyne Spencer represent the Flash’s lone holdovers from the 2014 season. Though there are many new faces on the roster, fans will recognize some familiar names on the back of the jerseys. Engen along with midfielder Becky Edwards were both part of the Flash’s 2011 WPS Championship winning squad, while defender Toni Pressley won the WPSL-Elite title with the franchise in 2012. Five of the Flash’s six 2015 College Draft picks are represented on the roster, including Canadian goalkeeper Sabrina D’Angelo who the club has signed to a contract. D’Angelo joins Chantel Jones, who was acquired via trade with the Washington Spirit this offseason, as the Flash’s two goalkeepers. Western New York has also added two preseason trialists, forward Kristen Hamilton and defender Chelsea Stewart, pending completion of their contracts. Per team and league policies, terms of the contracts will not be disclosed. Hamilton was drafted by the Flash in 2014 but suffered a season-ending knee injury during preseason last year. Stewart was allocated by the Canadian Soccer Association to the Boston Breakers for the 2014 campaign and will play her second NWSL season with WNY. Abby Dahlkemper, Samantha Mewis, Lynn Williams and Jaelene Hinkle – the Flash’s four 2015 First Round draft picks – were all signed to contracts with the club in March. Defenders Haley Palmer and India Trotter, who were contracted with the Flash through preseason, will not be participating in the 2015 season. Palmer has decided to opt-out of the upcoming season while Trotter suffered a season-ending ACL tear in her right knee during the preseason. With just 19 players, the Flash still have the opportunity to add one more player to reach the league maximum 20 players. In addition, the Flash has three of its six international player roster spots filled (D’Angelo, Kur, Nchout Njoya). Stewart, who was born in Colorado, holds dual citizenship and therefore will not use an international roster spot. Western New York kicks off the season at 7 p.m. ET on Sunday when it travels to face the Reign at Memorial Stadium. Following that game, the team will stay on the West Coast to prep for its second match at Portland Thorns FC at 7 p.m. ET on Saturday, April 18. 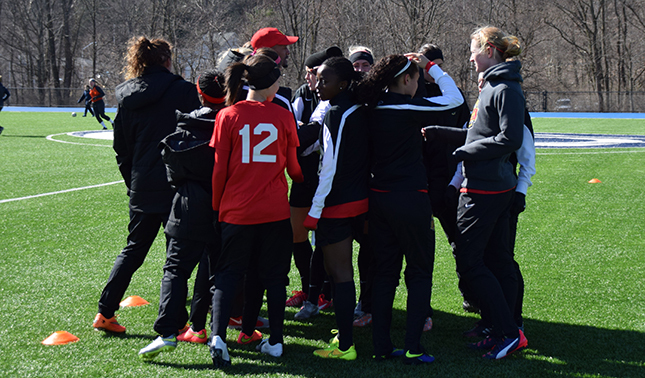 The club opens the home season on Saturday, May 2, hosting long-time rival the Boston Breakers at 7 p.m. ET. Tickets for all regular-season home games are now on sale. Fans can purchase by visiting wnyflash.com or calling the Flash at (716) 655-PLAY or the Sahlen’s Stadium Box Office at (585) 454-KICK. The complete 2015 promotional schedule is also available online at wnyflash.com.